Thomas passed away on May 10, 2014 after a long illness. He was born in Oakland, CA, November 11, 1947. Tom was a graduate of Pacific High School in San Leandro, CA, class of 1966. He was a member of the Youth of America Chorus in high school and in the years following. He worked in the car business for 35 years where he was known as “TC”. He enjoyed fishing with his son (there are no fish in Lake Chabot!!! ), and his favorite TV show was Jeopardy! Tom was survived by his beloved wife of 24 years, Donna, his son, Keith Cummings (April) of Yreka, CA. two loving granddaughters, Kylie 11 and Meadow 7. He is also survived by his brother in law, Alan Wiltse (Carol), nephew Loyde Inlow and niece, Deanna Inlow Venema. Tom was preceded in death by his mother, Carrie Belle Price, and his father, Virgil T. Cummings. He will be missed by all who loved him. At Tom’s request, there will be no services. So sorry to hear about Tom. He was a great friend and I will always remember the good times in high school and later when we were all young couples and our families hung out together. Our condolences to Dona and to Keith and his family. I will miss him. RIP my friend. 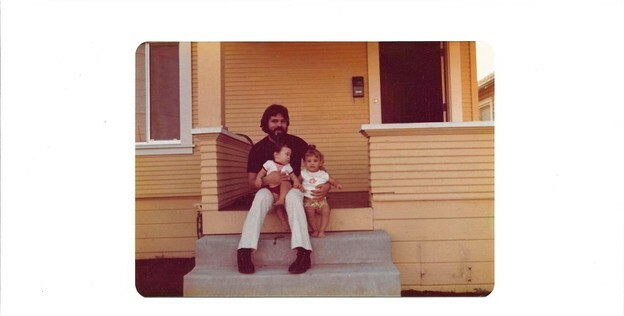 Picture below is at Tom & Karen's house in San Leandro with their son Keith and our daugther Cari (circa 1974). Thank's Rich, this is Donna. My heart is broken, but I will get through this. I wanted to let people know that you can leave messages in a guestbook on the mortuarys website. immediately, they check them for anything inappropriate, then post them later. I've already seen some good ones where people said kinda funny stuff, and that's good. the website is at Grissomsmortuary.com, look for this name and then look for sign/view guestbook. Anyone who knew and loved him are encouraged to leave a message, that our family can keep later. Thanks so much for the information about the webpage. Again, so sorry for your loss. I wish I could have seen him again these last couple of years. All the best to you and to Keith and his family. I would like to add my sincere condolences to the Cummings Family, Tom's wife, his children and Karen!! I had the pleasure of meeting Tom in 1963/64. We were 9th graders at John Muir Jr. High. He was going steady with Karen and I was going steady with Pam. The four of us, along with Rich Savino and whatever girl he happened to be dating at the time, never missed a dance! Tom was a "bad" boy who had a lot of style and class! I considered Tom a close friend! Whenever with him you could pretty much count on getting into some sort of mischief whether you wanted to or not. It was part of his charm! I hope he's in a better place now! And I prey he's no longer suffering! God Bless! I remember Tom. He and I were born a month apart. I remember him being a really nice guy. We were not best of friends, but he never said a bad word. Kinda makes one see his or her own mortality. At least he is no longer suffering, and in a better place. We will all miss him. I was deeply saddened,not to mention shocked too hear of Toms passing. He was one of my good friends in high school. May he forever rest in piece. My deepest sympathy too the the entire family. Larry.